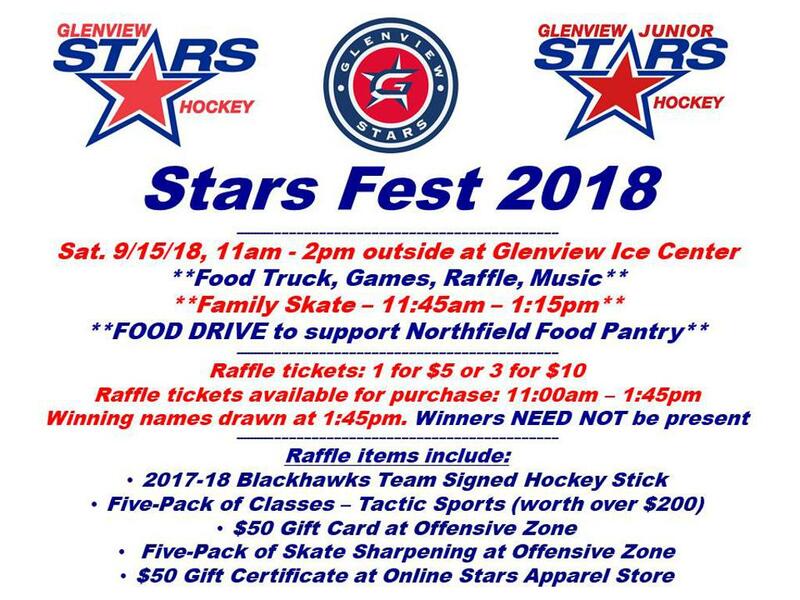 The Glenview Stars and Jr. Stars will host a "Welcome to the Season" party on September 15 from 11 a.m. to 2 p.m. at the Glenview Ice Center and all Stars & Jr. Stars players and families are encouraged to attend! This is a great way to reconnect with hockey friends and get fired up for the 2018–19 hockey season. Raffle with prizes that include Offensive Zone gift cards, Tactic Sports Performance training sessions, Glenview Stars apparel and the grand prize, a 2017–18 Chicago Blackhawks team-signed hockey stick! FOOD DRIVE: The Stars will be collecting food for the Northfield Township Food Pantry! Last year the Stars & Jr. Stars delivered over 2,000 food items to serve the less fortunate and our goal is to exceed that number this year! We will start collecting during tryouts over Labor Day weekend and continue through the Stars Fest on Sept. 15. Lets show the community again that the Stars and Jr. Stars care!